I'm not usually one for historical fiction, but when I see novels floating around telling the stories of authors and revolutionary figures, I can easily be won over. Mary Shelly is a woman I've been interested in learning about since I was in lower school and someone exclaimed to be that 'Frankenstein was written by a girl! And she was only eighteen when she wrote it!' How could I not be interested? I never studied the novel in school, whereas many other people did, and when I reached university we spent a lot more time focusing on the writings of her mother, Mary Wollstonecraft, alongside our Romantic and Victorian literature modules. The Determined Heart is a fictionalised version of Mary's life, with the author's note at the end stating that creative licence was taken in a few cases to help the story flow more, but the majority of what's on the page is as it was. Obviously conversations are fabricated because, well, obviously. The story begins with Mary as a child adjusting to her father's new romance after the death of her mother. From here to begin to see her relationships, including that with her sister Fanny and her new stepsister Clara. We're introduced to a lot of characters at once which can be quite confusing, but I found it easy to tether them out once the story really got underway. We read about Mary meeting her future beau, Percy Bysshe Shelley, the conflicts that arise through Fanny and Clara's infatuation also, the rejection of Mary by her father, and the explosive arrival of the beast that is Lord Byron. There is a great deal of world travel and grand adventures, juxtaposed with constantly troublesome relationships between, basically, everyone. There is infidelity on all sides, which Mary must deal with in the name of 'free love', something her mother believed in (and got in a lot of trouble for). The most interesting relationship dynamic in the story for me was between that of Mary and her deceased mother. Throughout her life Mary is compared to her feminist, revolutionary, philosophising mother, loved by many, but hated by just as many. The burden of her mother's 'scandalous' views does not serve Mary well when she herself is judged for her elopement with Bysshe and rejected by her family. All men that meet her comment upon how like her mother she is, with many stating they liked her but found her views a bit...much. We see many decisions being made by Mary that create a conflict between her strongest feminist ideals and her obsessive want for Bysshe, a family, more children, stability, and fidelity. One thing I had issue with in this novel was the unnecessary name-and-quote-dropping. Especially at the start of the book, I found the exposition and inclusion of famous names far too in-your-face, and feel it could have been done in a more subtle way. There was a lot of 'Bond, James Bond' going on when you met new characters, or heard of their existence, which took me out of the story momentarily. 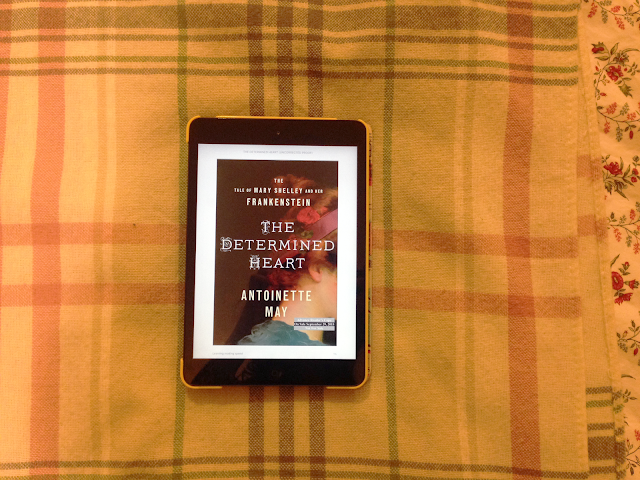 I will praise Antoinette May, however, for the depth of her research for this novel as the detail she goes into at times is incredibly impressive. You can tell that this has been a subject she has enjoyed studying and is passionate about, which in turn makes it very enjoyable to read. Overall I would recommend this book to those interested in reading more about Mary Shelley's life, and aren't worried about a bit of added drama. It's a quick read that I sped through in a matter of days and really rekindled my love for this time period.